It's beginning to look a lot like Christmas, only here in FL the weather is still in the 80 degrees most of the days, which makes sledding a dream land only activity. Nikolai has been fascinated with snow globes since he was a little boy, and we have collected many of them throughout the years. and lately we have to say 'no' whenever he wants to get one. I purchased the cookie cutter/stamper from Target last year if I'm not mistaken, and I've not seen it this year. You can recreate this by using a circle or snow globe shaped cookie cutter and a snowman fondant stamper if you have one or just a snowman cupcake pick. Snow globe sandwiches (stacked) with snowflakes mozzarella cheese surrounding the globe. Cucumber slices and organic baby carrots with a cute snow globe cupcake pick. This lunch was packed in a leak-proof Yumbox Panino. Love this lunch! The snow-globe is very cute! 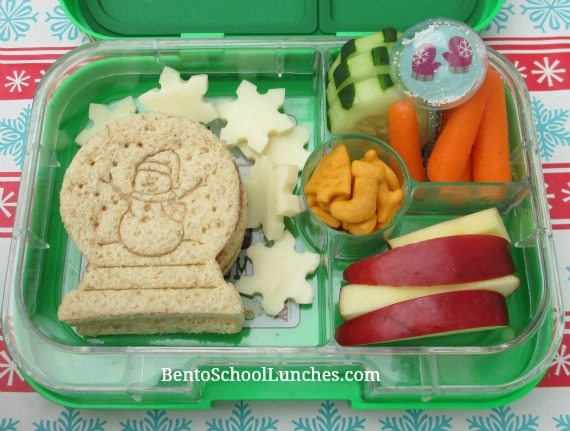 Love that snow globe and snowman imprint on the sandwich! Love the snow globe! Belated Merry Christmas!